Oregon Mushrooms offers a variety of earthly delights, such as dried wild mushrooms for your enjoyment – we’ve made mushrooms our passion and we want to feed your passion for them too! We gather and collect our mushrooms according to what’s in season, and then we dry them soon after to lock in freshness and aroma. 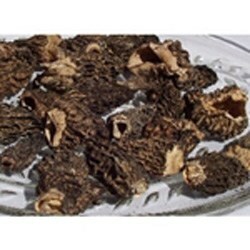 Our selection includes dried black trumpets, dried morel mushrooms, dried matsutake, dried porcini mushrooms, dried shitake mushrooms, dried maiitake mushrooms, dried chanterelle mushrooms, dried turkey tail mushrooms, dried lion's mane mushrooms, dried agricus blazei murrill, dried lobster mushrooms, and more! Enjoy that just picked mushroom flavor all year round, since fresh is not always available -- perfect for stir fry or stews at home or over a campfire. There are many uses for dried mushrooms. For more in dried mushrooms, explore our full selection using the links in the sidebar to the left.All of our dried mushrooms are gluten free and are GMO free. Our mushrooms are not processed with any chemicals, and are not sprayed with pesticides. Our wild mushrooms are grown in forests where the soil is clean and they are not sprayed with anything. The cultivated mushrooms are not chemically treated.